An unforgettable account of betrayal, revenge, redemption. Focus on the Family Radio Theatres product of Ben-Hur tells the tale of a nobleman who fell from Roman favor and was sentenced to die as a slave--all at the hands of his childhood friend, Messala. Once nearly brothers, any hope of reconciliation is dashed after Messala is seriously injured during a vicious chariot race won by the vindictive Ben Hur. 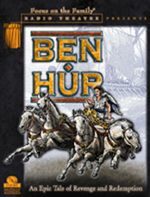 But what makes this adaptation of Lew Wallaces best-selling story unforgettable is the changed man Ben Hur becomes after seeing Christ on the cross. Recorded in London with film-style sound, this action-packed production shares that compassion is the true path of redemption.